Used, Professionally fabricated Twin Weber/Dellorto 40/45s spaced inlet manifold for Suzuki Swift G13B “Twin Cam” 16v engines. Nicely made with correct coolant spigot etc. Ideal for use with Jenvey ITBs or bike throttle bodies with manifold adapter rubbers. 2010 SUZUKI ALTO SZ3 1L PETROL 5DR FULL CAR BREAKING FOR SPARES AND PARTS. PINK - 5 DOOR - 996cc PETROL - 5 SPEED. - Front & Rear Panel- Radiator fan- Wings- Rear Quarters etc. - Bumpers - Tailgate- Lights- Glass- Door- Interior Trims. SUZUKI ALTO 2009-14 INLET MANIFOLD (1.0l 12v Petrol K10B) Condition is Used. Dispatched with Other 48h Courier. SUZUKI VITARA MK4 1.6 2015- AIR INTAKE INLET MANIFOLD M16A. GENUINE USED SUZUKI PARTS •. Used item in good condition full working order. Excludes highlands, ireland and islands. 2009-2015 SUZUKI ALTO 5 DOOR 1.0 I NTAKE. INLET MANIFOLD WITH MAP SENSOR. MOST ELECTRONIC COMPONENTS REQUIRE PROGRAMMING OR ADAPTION. 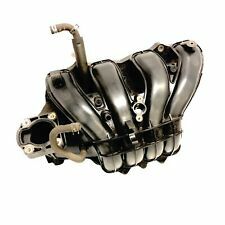 For sale i have an intake manifold from a 2006 Suzuki Grand Vitara 1.6 petrol. Inlet Manifold - Genuine MAHLE. Suzuki Swift Sport 1.6. Removed from 2016 Sport with 19k on the clock. SUZUKI ALTO 1.1 16V F10D INLET MANIFOLD INTAKE 2003-2008. ENGINE - 1.1 16V F10D. REMOVED FROM - SUZUKI ALTO GL MK4 5 DOOR HATCH. This is an original quality part manufactured by Pierburg. FOR SUZUKI SWIFT. THIS ITEM HAS BEEN REMOVED FROM A 2016 SUZUKI VITARA 1.4 BOOSTER JET. THIS IS A GENUINE SUZUKI USED PART. We will always help you to have a 100% positive happy buying experience. PART NUMBER: 13110-61MA0. This is an original quality part manufactured by Pierburg. FOR SUZUKI SPLASH. Valve Type:Solenoid Valve. Vehicle compatibility. This is an original quality part manufactured by Pierburg. FOR SUZUKI IGNIS II. Fuel type : Petrol. Details : SUZUKI SWIFT GL Intake ManifoldSWIFT 2007. Part Type : Intake Manifold. Model : SWIFT. Make : SUZUKI. Year : 2007. Fits also. This is an original quality part manufactured by Pierburg. FOR SUZUKI SX4. FOR SUZUKI SX4. This is an original quality part manufactured by Valeo. Vehicle compatibility. Number of connectors:5. Inlet Manifold. 1061cc 61/46 16v. About MGV Auto Spares Ltd. Our Opening Hours are:-. Engine Size. CASH ON COLLECTION. FOR SUZUKI SX4. This is an original quality part manufactured by Lucas. Number Of Poles:5. Suzuki Swift. 45 x 30 x 20 cm. Your warranty only covers the cost of the part itself and not any labour costs incurred in fitting / removing the part.more. Plastics and Carpets we always advise cleaning/valeting before fitting. 1.5L (1490cc) Petrol 102 Bhp 3Door Hatchback 5 Speed Manual RHD Air Con: Yes. Shelf location: INLET MANIFOLD. We are Breaking a 2009 Suzuki Swift GLX. Paint Colour: Superior White. Mileage: 86,727. Wing Mirror Type. Suzuki Swift GTi G13B 1.3L. TIG Welds for Strength & Durability. Flange: 5 bolts. 2003-2006 SUZUKI ALTO 1.1 INLET MANIFOLD. HAS ONLY COVERED 14,000 MILES. Make sure the part you are purchasing is the correct one as we are not responsible for part incompatibility. The photos of the products are of the actual Item unless stated otherwise. 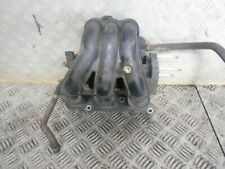 Suzuki celerio 1.0 petrol Intake Manifold . Working well. Comes as pictured complete. Fits celerio 14-19. Removed from 16 plate celerio. Any questions just send message. International postage welcome. We post wherever you need. Thank you for looking. NOT HAPPY?. - let us know so we can fix it. Part numbers are provided to help identify the part and its compability. We love to hear that you are satisfied with our service and parts. We have a wide range of vehicles and parts on site. SUZUKI GRAND VITARA 1.6 LITRE PETROL 2007 MODEL. INLET MANIFOLD. AJ SPARES is a large independent Vehicle Dismantlers. South Yorkshire. The Blue Containers. REMOVED FROM A 2015 SUZUKI CELERIO 1.0 K10B. DISMANTLER BASED IN BOLTON IN THE NORTH. SUZUKI SWIFT. REMOVED A 2006 SUZUKI SWIFT 1.5 GLX. CHANNEL ISLANDS. G&A Car Spares, established 2010. 8.00am - 5.00pm, Mon - Fri. OUR REF: C76. ISLE OF MAN. 2013 SUZUKI ALTO SZ4 5 DOOR 1.0 PETROL AUTO. THIS ITEM IS REMOVED FROM A 2013 SUZUKI ALTO SZ4 5 DOOR WITH A 1.0 PETROL ENGINE & AUTOMATIC GEARBOX. INTAKE / INLET MANIFOLD & throttle body. CHANNEL ISLANDS. Fits:-Suzuki Splash 1.0cc Petrol models made from:- 2008 to 2014 with Part Number:-1072351S01. For Sale:-Suzuki Splash Intake Manifold. You won't find cheaper prices anywhere! High quality products at amazing prices. 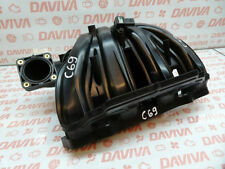 THIS ITEM IS A USED SUZUKI SWIFT 1.3 PETROL (M13A) INTAKE MANIFOLD. REMOVED FROM A 2005 SUZUKI SWIFT GL. Suzuki Swift GTi G13B stainless steel exhaust manifold. Application : Suzuki Swift GTI G13B. Suits : T25/T28 turbos. Item Includes: 1 Pcs exhaust manifold with gaskets as show in picture. T-304 Stainless Steel. 2009-2014 1.0 3 CYLINDER PETROL INLET MANIFOLD ENGINE CODE: K10BN. SUZUKI ALTO SZ3. REMOVED FROM A 2010 SUZUKI ALTO SZ3. FITTED WITH A 1.0 3 CYLINDER PETROL ENGINE. CHANNEL ISLANDS. OUR REF:B17. ISLE OF MAN. This is an original quality part manufactured by Pierburg. FOR SUZUKI WAGON R.
This is an original quality part manufactured by Pierburg. FOR SUZUKI JIMNY. 2008 SUZUKI SWIFT SPORT 1.6 PETROL 5 SPEED MANUAL 3 DOOR HATCHBACK IN RED. VEHICLE MILEAGE: 37,500 MILES. Prestige Auto Salvage Ltd 1 Canal Side Close Walsall West Midland WS3 1NZ. PART NUMBER: 63J-A01 MB197400-3090. FITS VEHICLES - SUZUKI ALTO 1.0L PETROL 2002. INLET MANIFOLD IN GOOD WORKING CONDIITON. FOR YEARS: 1998, 1999, 2000, 2001, 2002 (2002). PART NUMBER - N/A. Removed from a 2005 SUZUKI LIANA GL 1586cc. FOR YEARS: 2001, 2002, 2003, 2004, 2005, 2006, 2007 (2005). Warranties cover Parts Only and only apply if parts are fitted by a recognised independent specialist or approved dealer. SUZUKI SX-4 AERIO 2010. INLET MANIFOLD. 5 DOOR HATCHBACK 2010 MODEL. AJ SPARES is a large independent Vehicle Dismantlers. South Yorkshire. The Blue Containers. FOR SUZUKI IGNIS II. This is an original quality part manufactured by Lucas.